The Robot View displays in a 3D view the robot Choregraphe is connected to. 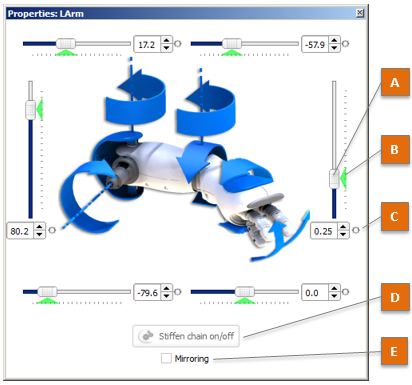 It allows you to check and modify the joint values (and then move the limbs) using the Limb properties. objects, people or zones involved in the world perception. Hide or show information data such as FPS and triangles displayed. Hide or show objects stored in memory by the ALWorldRepresentation module. For further details, see: ALWorldRepresentation. Disable tracking of the robot position in the world. If checked, the robot torso will not move on the grid nor rotate. Disable tracking of actuator values. If checked, the robot will be frozen on the display, in order to save CPU on the robot. Hide or show the areas defined by ALEngagementZones module. For further details, see: ALEngagementZones. Hide or show people detected by ALPeoplePerception module. Caution: if show is selected, the ALEngagementZones module is launched automatically each time you connect Choregraphe to a robot. For further details, see: ALPeoplePerception. By default, the point of view is on the front of the robot. Move up, down, right or left Drag using the left button of the mouse. Zoom in and out Use the scroll wheel of the mouse. Turn around a point Drag using the right button of the mouse. 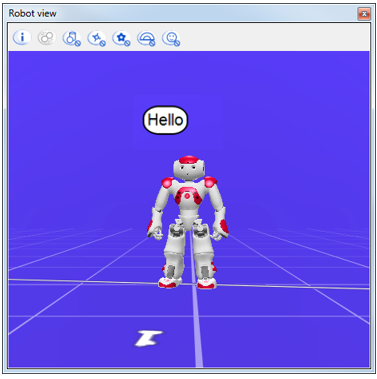 Click any robot limb or objects in order to display their properties. Limb properties and Rotation handles. This panel enables you to modify the joint values of each limb. Allows you to adjust the joint value. You can move it, as well as enter a value in the associated text box. The robot tries to reach the command value with its joint as soon as possible. Storing joint value from the Robot view. The color indicates if the requested value has been reached. (green) means the current joint value = the last requested value. (blue) means that the joint value is not (or not yet) the requested value. the joint cannot reach the requested value. It is the case when there is an obstacle as an other body part or a wall for instance. Saves the defined value, when a Timeline box is currently opened. (grey): you cannot store joint values because you are not currently editing a Timeline box. (black): the current joint value is not stored at the current selected frame. (black and red): the current joint value is being stored at the current selected frame. For further details, see: Storing joint value from the Robot view. Sets on/off the Stiffness of the whole selected chain of joints (Head, Arm or Leg). (green): Stiffness off, you can move this part manually on the real robot, but commands have no effect. (orange): intermediate state depending on the Stiffness value. (red): Stiffness on, the robot is able to move this part when requested, but you cannot move it manually. If selected, actions (send a command value, register a joint value, etc) are also executed on the symmetric limb. For example left and right arms will move the same way. 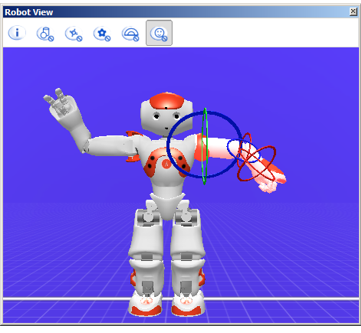 In the Robot View, click any moving part of the robot (head or limbs). Use one of the Sliders to adjust the joint value. Make sure Choregraphe is connected to a real robot. Make sure the Stiffness is on. If not, click the Stiffen chain on/off button. Simulated and real robots move together. If you chose a leg, hold your robot by the waist/torso to prevent it to fall down. Make sure the Stiffness is off. Move the real robot manually. Make sure a Timeline box is opened. Click on the Timeline in order to select the Motion keyframe you want to modify. Use one of the Sliders to adjust the joint value, or click the Record button. The Record button becomes red and the joint value is stored in the current Motion keyframe. Click on the Motion keyframe you want to modify. the Record button becomes black and white and the joint value is removed from the current Motion keyframe. Create a movement on a real NAO. Rotation handles allow manipulating directly the joints of the selected limb. The position is given relatively to the Parent object. Additionally, you can give a specific shape, color and scale to the object. Colors are defined as float between 0 and 1. 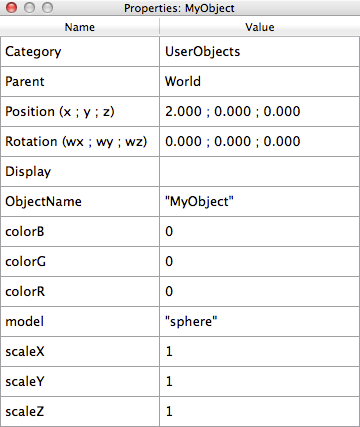 # assuming the object "myobject" exists in category "mycategory"
For more details, refer to ALWorldRepresentation. If you want to set a custom model for your object, just provide an Ogre mesh model (*.mesh file) and put it in the share/choregraphe/media/visual folder of Choregraphe installation directory. The name of the model to provide to ALWorldRepresentation is without the .mesh extension.